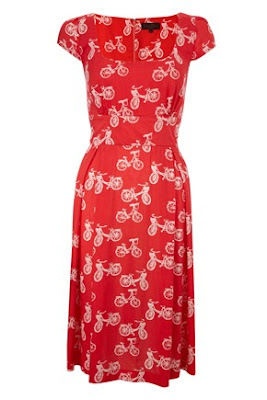 When my friend Kate showed me her new bike print dress, I started to wonder about what other modes of transport you can get printed on frocks. I've had endless fun googling different permutations of "transport+dress" for this post. 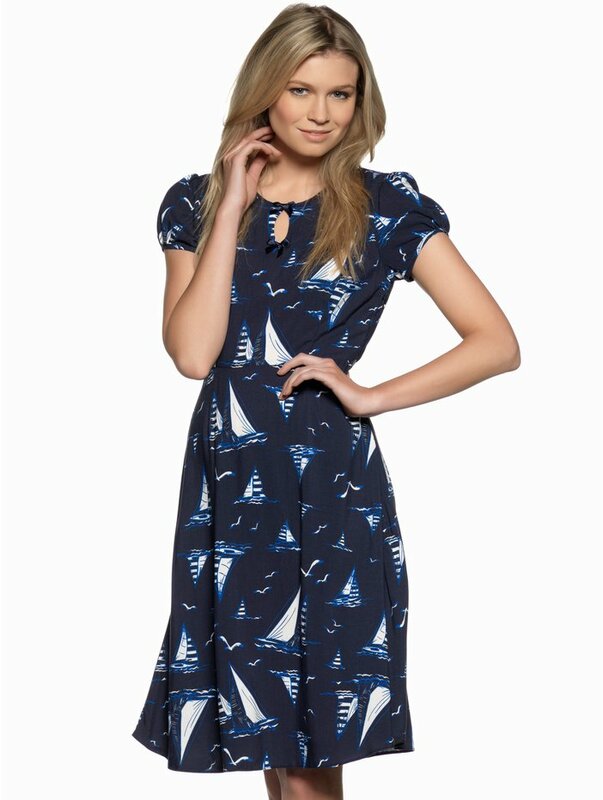 Canoe print dress? Helicopter? Hovercraft? Let's start with that bike print. This glorious dress from Great Plains welcomes summer with a whoosh of its pleated skirt. It's a very flattering cut that you could wear to a picnic (ok, not just yet, but picnic weather is definitely nearly upon us) or the office or the pub or anywhere and everywhere. It's £65 and comes in green and blue too. Choo choo! Cath Kidson is normally too tooth-achingly twee for me, but this £55 train print scoop neck dress is ticking my boxes. I've already earmarked it for this year's Indietracks festival. It comes as a skirt as well. Actually, Cath's gone train mad and put it on shirts, umbrellas, wallets, badges, bags and more. CALM DOWN, CATH. This Emily and Fin dress might look like a cloud print (boo! Overcast! Grey! ), but look closer and you'll see tiny aeroplanes darting between them (hooray! Holidays! To Foreign!). The fifties style cut is gathered at the shoulders and waist - and hold the phones, it's got pockets! Put your passport in one and your ticket in the other, and away you go. Yours for £58 from Aspire Style. I love this wild horses print dress from Ted Baker, not least because it has a neon pink trimmed zip at the back. But Mr Baker - the ponies are getting SQUASHED! I thought the EU had outlawed this sort of animal overcrowding! FREE THE TED BAKER PONIES! This dress costs 5.13 ponies (in Cockney rhyming slang), which is £129 (in actual money), from Ted Baker. 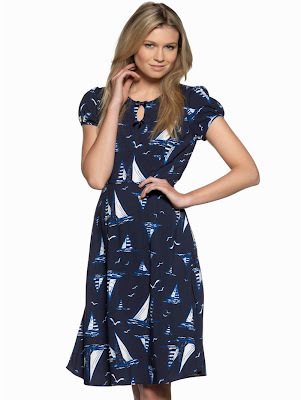 Here's one for the petite ladies - a boat print tea dress priced £39 from M&Co. I love the colour, the print, the tie-fastening waist, and the keyhole detail with little bows, in case anyone had missed the demure inch of skin you were flaunting. 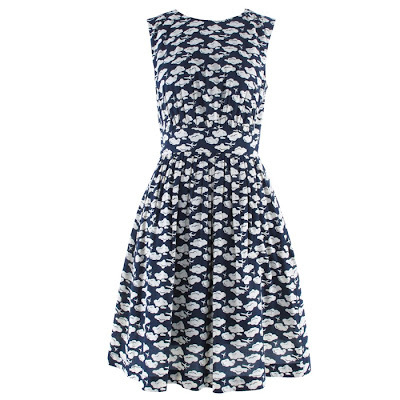 For you nautical-loving non-petites, M&Co do a white dress covered in sweet watercolour style boats for £45. 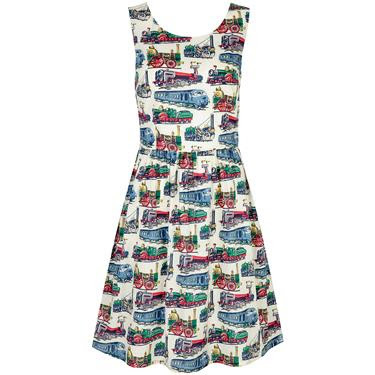 I want a train dress. ME TOO. I want them all, really. These are ace. For some time now (after seeing a 4 year old wearing one) I have coveted a squirrel print dress but I suspect that the season for squirrel print dresses has now passed...I may have to purchase a cloud/plane print dress as a coping strategy. I too am often inspired by children's clothes (read: want to trip them over and steal their dresses). A squirrel print dress would be amazing! I think I know what my next Google search will be.